A Centennial Collection of stories about the Seeley Lake Area. In 1987 the members of a grooup known as The Seeley Lake Writers Club decided to meet once a month to provide support for their fellow writers, photographers and historians. After a few months, this small, informal group decided to gather their stories into one book, with the combined goal of publishing the book in time for the Montana Centennial in 1989. 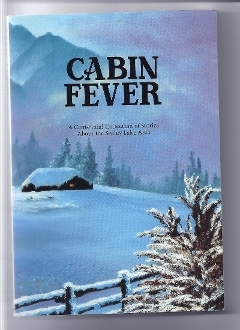 Cabin Fever was born. Early in the project, it seemed sensible to organize these stories about the past 100 years of life in the Blackfoot, Clearwater and Swan Valleys in chronological order. The book is divided into six parts. Part 1 tells about early Indian activity in the Clearater and Swan Valleys. Part 2 tells about the Seely family, homesteaders and trappers. Part 3 tells stories about logging in the area. Part 4, the USFS. Part 5 is stories about summer homers and Part 6 talks about the town.